The oldest town in West Virginia invites visitors to explore arts, history, and hometown hospitality. His story is not unusual. Romney is a surprising locus of art, culture, and, of course, history that’s been attracting visitors and new residents for more than 250 years. Although it is now considered West Virginia’s oldest town, chartered the morning of December 23, 1762—the mayor will happily supply you with a copy of the official legislative citation—much of what Romney has to offer visitors is a product of recent transformations. History—especially Civil War history—burns hot in the blood for Romney residents, but so do civic engagement and the arts. 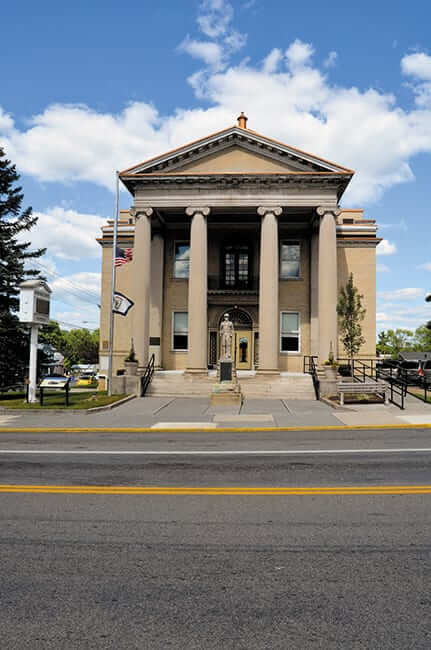 Romney may be the oldest incorporated community in the oldest county in West Virginia, but it continues to reinvent itself through the passion of new residents, entrepreneurs, and artists. More than 150 years ago, visitors to Fort Mill Ridge would have been met by some 2,000 weary soldiers, guns ready, many standing sentinel behind solemn rows of black cannons. Many were probably nervous. The ridge is often shrouded in a curling blanket of fog and enemy forces moving to capture Romney would have been hard to spot in the early hours. The fort lies just south of Romney itself, between the ridges along Mill Creek, and is today considered one of the best preserved examples of Civil War trenches left in the country. It’s ghostly quiet and the odd shaped central redoubt where the artillery once stood yawns grave-like in the center as visitors circle the entrenchments along the trail. Built in 1863, the fort was home to Union solders tasked with watching and guarding key roads into the city. Each marker along the 45-minute trail reveals another morsel of rich history. Like many communities in the Eastern Panhandle, the people who lived along the South Branch of the Potomac considered themselves Virginians. Romney was (and still is) the seat of Hampshire County, an area that was always rich in agriculture, with large slave-holding farms more in tune with neighbors to the east—Virginia and Maryland—than communities to the west. On the whole, Hampshire County natives sympathized with the Confederacy, and they did not go quietly in the fight to tear a new state from the fabric of the old. 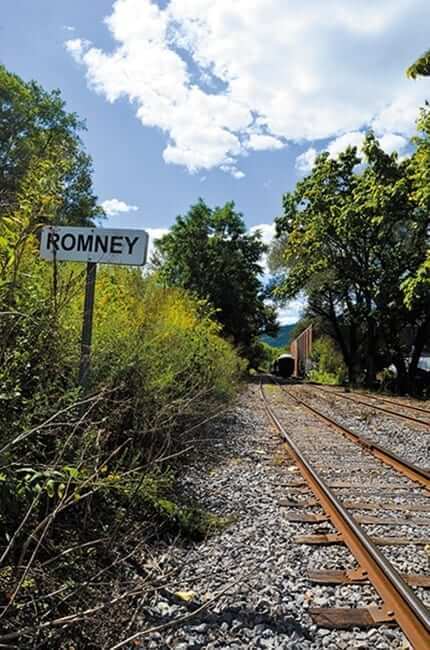 To make matters worse for residents, Romney was located along a highly strategic road—the Northwestern Turnpike—near the B&O Railroad, which was a connecting line between the port of Baltimore and the Ohio River. Both Union and Confederate troops fought to keep the town. Tossed back and forth between occupiers many times (some say as many as 56 times), Romney residents suffered but endured and eventually thrived. Just five years after the end of the Civil War, the West Virginia Legislature established the West Virginia Schools for the Deaf and Blind in Romney where the Romney Literary Society once gathered. Today, the schools still attract new residents and new businesses and their services reach more than 4,800 children. 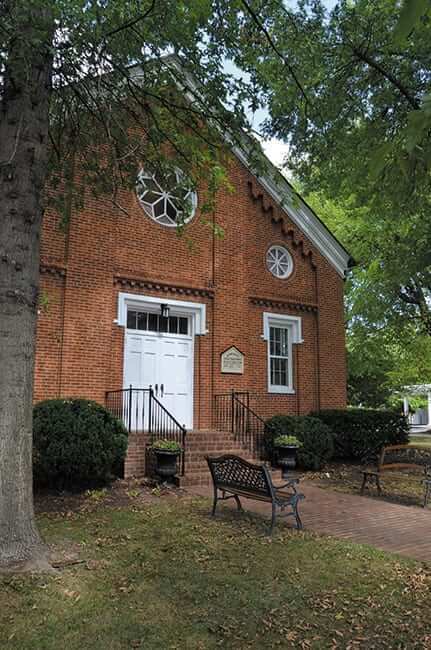 Visitors can spend all day touring Romney’s historic streets, and most start at Taggart Hall Museum, which houses a small but revealing collection of local Civil War history, Fenton glass, and a gift shop, as well as the Hampshire County Convention and Visitors Bureau and the Fort Mill Ridge Foundation. Nearly every building in Romney has been marked by the Civil War. In fact, Romney was second only to Winchester, Virginia, in activity during the conflict. A stately red brick home on Main Street was once Stonewall Jackson’s headquarters. The log-sided Davis History House still sits on its original lot and contains documents from 150 years of local history, including the Davis family’s secret involvement with the Confederates during Union occupation. Even the Romney Presbyterian Church was once a Civil War hospital. Nearby, the Wilson-Wodrow-Mytinger House is the oldest public office building in the state and now houses an animal hospital. Odd though it may sound, some of the most fascinating pieces of history in Romney lie buried. A trip through Indian Mound Cemetery will lead you to the First Confederate Memorial in the nation and an ancient Native American burial mound. Clusters of historic brick and clapboard buildings line Romney’s streets, and through the careful efforts of residents, a few have taken on new life as small businesses or community centers. The historic brick-sided Coca-Cola bottling factory on Main Street is now a thriving community arts building. Managed by the Loy Foundation, The Bottling Works hosts live music, art shows, community groups, and the Romney Farmers Market. In fact, visitors are often surprised by the vibrant arts community in the area, and the Hampshire County Arts Council (HCAC) is a major force behind this movement. Comprised of volunteers, the HCAC regularly puts on events, workshops, and camps to encourage art of all kinds in the region. In November 2013, art studios, shops, and galleries in Romney and surrounding communities will throw open their doors to visitors for the seventh annual Hampshire Highlands Studio Tour, a three-day event showcasing work from local artists at venues around Hampshire County. But if you want a real taste of Romney culture, the Hampshire Heritage Festival held the second weekend in September showcases regional arts, crafts, food, music, and even a lumberjack championship. Not only is this little hamlet a hotbed for the arts, but it has a world-class attraction at its doorstep. The natural trough near which Romney sits is a remote, forested canyon dissected by the pristine waters of the Potomac’s South Branch and it’s only accessible by train, canoe, or kayak. The Potomac Eagle scenic railroad takes visitors through this slice of untouched wilderness, mixing in a little history and wonder en route. “I’ve ridden a lot of other excursion trains, but we have some of the most beautiful scenery in the world,” Rodney says. “The river is so clear, you can see fish swimming in the bottom.” A typical three-hour narrated tour through the trough is like a journey through time. And you’re nearly guaranteed a bald eagle sighting. “We see them all the time, but it’s watching the other people react when they see them that I enjoy,” Rodney says. To keep things interesting, Rodney also offers all-day trips from Romney to Moorefield and Petersburg and special excursions like the Murder Mystery Train. Those looking to access the trough via water can always stop at the Trough General Store at the mouth of the canyon, where canoe and kayak rentals, snacks, gear, and even camping spots are available. In Romney, no two businesses take the same approach to fulfilling residents’ and visitors’ needs. A thriving store like Dillon’s Country Treasures on Main Street offers not only country décor but shelves of Vera Bradley, rows of Yankee Candles, and gleaming wood crafts. Longtime resident and owner of B-Belle’s Boutique, Linda Corbin moved her eclectic shop to an aging 1884 white clapboard home on Main Street with the intention of expanding her offerings to visitors. After some significant renovations—unearthing wood and brick from layers of carpet and paint—the home became the perfect backdrop for her assortment of jewelry, West Virginia University gear, purses, and local crafts. Patty Anderson, owner of Anderson’s Corner, moved to Romney in 1972, opened her shop 31 years ago, and still watches the business landscape change from her historic Main Street storefront. “We work together and promote together. I think that’s part of the success of businesses in small towns. The ones that do well are actively involved with all the local sports, fundraisers, and nonprofits. We talk to people,” Patty says. “We have a lot of camaraderie in the business community in Romney. Everyone works together to try and make it the best possible place to live.” Anderson’s Corner isn’t just a place to find high quality jewelry and local arts, crafts, and foods. Like many stores and restaurants in Romney, it’s an unofficial meeting place. “People stumble into our shop and they become customers and friends,” she says. “I have women who come into the shop just to try on jewelry. They call it Anderson’s clinic. We have a great time sampling wine and trying on jewelry.” Today, Anderson’s Corner has two storefronts—one in Romney and one in Moorefield—and continues to expand, bringing in jewelry artists and designers from big brands like Trollbeads while also offering an indispensable venue for local goods. Restaurants, too, cater to local tastes. For Romney residents, a cup of coffee or a chicken salad sandwich at the Courthouse Corner Café are a daily necessity. Dinner options include fine Italian fare at Italian Touch and fresh pizza at Mario’s. Shirley’s Diner is a local institution housed in a cozy little building that was, at different times, a creamery, a saddle and tack shop, and a taxi stand. On game nights, locals flock to the Brass Rail for delicious finger foods, cold beer, and the latest gossip. Arguably one of the oldest and most unique businesses in Romney, Koolwink Motel on Route 50 once attracted weary travelers for a clean bed and a hot shower. Now it brings in train and history enthusiasts each season. Family owned and operated for more than 70 years, the motel is a one-of-a-kind 1950s-style destination in itself, with pristine rooms decorated in vintage décor, flat screen TVs, wireless Internet, spacious porches, and a real dose of hometown hospitality. “This community is very similar to the little community I grew up in,” says Romney Mayor Daniel Hileman. “More than anything else, growing up on a farm, I just have to have some dirt to play in. It’s a great lifestyle. I have the freedom to escape the hustle and bustle if I want to—and you need that once in a while—and we can also dash into D.C. It’s a geographic plus.” Like many of Romney’s most passionate citizens, Dan moved to this little community on the river because it lives in the shadow of larger metropolitan areas but stayed because of the area’s unique blend of old and new—history and progress. As mayor, he sees Romney on the cusp of exciting changes. Residents are getting more involved in community life, new businesses are moving in, and established businesses are thriving. Romney is the home of Peterkin Episcopal Church Camp–a beloved destination of mine and my three younger siblings. What an adventure to go so far north from Charleston. I don’t remember too much any more except for the names of some of the buildings, cold creeks, evening vespers, and the beautiful A frame church. Truly a place where God lived and I learned that.